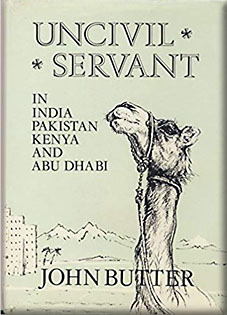 Here is a straightforward contribution to what the author apologises for as "the flood of reminiscences written by former servants of the British Empire", well written, well produced, and well worthwhile as an addition to the genre. Butter's choice of title owes less, it seems, to a play on the old chestnut about the Holy Roman Empire being neither holy nor Roman nor an Empire, with which a rightly angered Nigerian nationalist once assailed me in condemning District Officers as being neither obedient nor civil servants when they so signed their letters; but rather, as we are told, to his 'uncivil' reputation as a "useful if cantankerous mercenary... tolerated by my various political masters", with a tendency to be "too kind to those who worked for me and too abrasive towards those for whom 1 worked". Be that as it may, Mr. Butter was looked on as a wanted-enough civil servant to go on serving the government of Pakistan for two years beyond independence. John Butter was one of the last regular batch of recruits for the Indian Civil Service (though he was not to know it at the time), fifty-two of them in all (exactly half of them British, half Indian) who sailed from Southampton in that very September of 1939. His narrative tells of his district service in the Punjab from 1939 to 1942 and again from 1946 (including that year of violence in Amritsar) to the end of 1949. The next ten years were spent in government service in Kenya, first on a Crown Agents appointment in the Treasury and then in the Colonial Service, where he ended up as Permanent Secretary to the Treasury and finally as Financial Adviser. Turning down "offers of other jobs in the dwindling colonial empire", namely Botswana and Hong Kong, Butter spent 1970-1983 as Director-General of the Abu Dhabi Finance Department without, he notes regretfully, ever learning a word of Arabic: "one of the greatest uncivilities" of this self-styled uncivil yet humorous and humane public servant. I for one prefer the genuine value of Mr. Butter's uncomplicated, T Was There' rationale to his heavier "excuse" for writing, namely that "the successes and failures of Westminster-type democracy as an export commodity have a relevance to the solution for some existing problems not only in Africa and Asia". Nor am I convinced that his experience of having served "on both sides of the Independence fence" is, as he claims, "unique". Rather, I am simply glad to have this memoir on my library shelf, to enjoy and to refer to. What is more, its publication gives me the opportunity to seek the co-operation of OSPA readers. A Colonial Office source tells me there were 167 ICS officers who transferred to the Colonial Service between 1947 and c. 1950 but cannot name a single name. John Butter is one, Charles Chenevix Trench another, Arthur Williams a third, Reginald Salaway a fourth. Can readers help me identify the missing 163 names?